Medical student Khalid Nassour is in the Brooklyn Museum, being beckoned by a disembodied voice to don an ancient artefact - the golden helmet of Fate. He thinks he's having some kind of unwanted drugs trip, but if he doesn't believe, and embrace his destiny, it could be the end of everything. 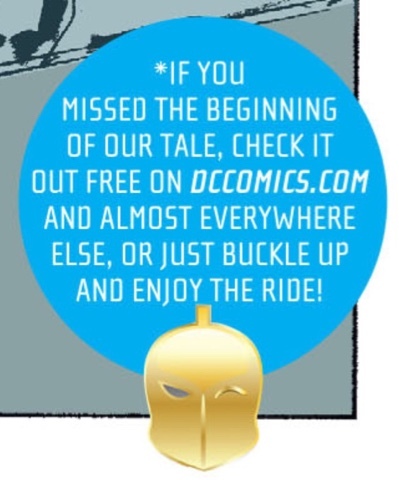 DC's Sneak Peek at this new series promised much, and the first issue proper delivers. 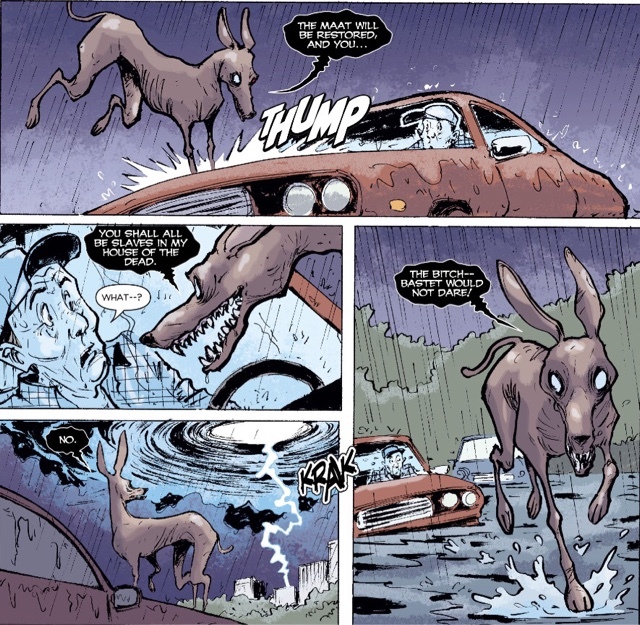 Writer Paul Levitz and artist Sonny Liew maintain the atmosphere of foreboding, as near-biblical rains threaten to drown the city, while grounding things with the everyday personalities of Khalid, girlfriend Shaya, and parents Mohammad and Mom-whose-name-we-don't-yet-know. Levitz balances ancient and modern, warring deities and mobile phones, as he sets up his opening story. Khalid, at the centre of both literal and metaphorical storm, is likeable, naturally heroic, even if he's a very confused 'son of the pharaohs'. The enchanted helmet's backstory is tweaked from DC's traditional Fate fable, but still linked to a seductive fantasy of classical Egypt. I'm not a huge fan of text messages in comic books, but Levitz gets the tone right, and he's far too smart a writer to use the device too often. 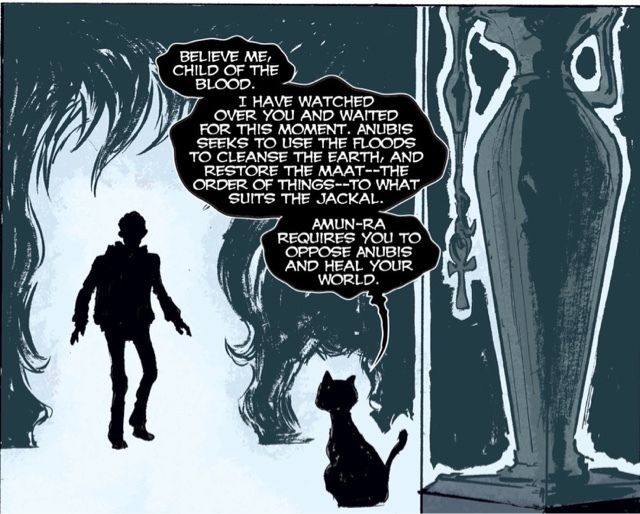 The deities, incarnated here as cat and a rather frightening dog, are suitably otherworldy, while the relationships between Khalid and his loved ones promise to be a highlight. 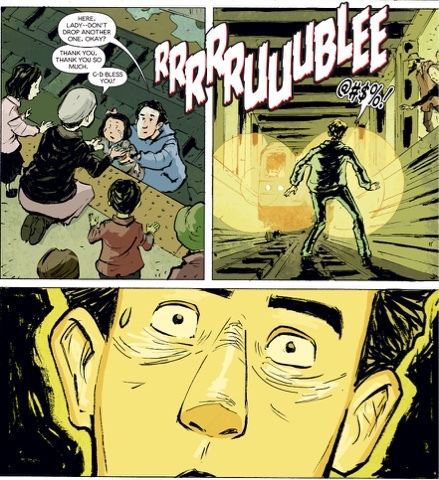 Liew's cartooning is a superb fit for Levitz's script, giving us enough of the mundane to ensure the more fantastical elements really stand out. Personalities shine in faces - even in the face of a black cat/goddess - and New York looks fabulous in the rain. A subway-set scene sings as Liew ramps up the drama, while the ending hits a suitably shocking note. Lee Loughridge colours with sensitivity, always complementing, never overwhelming Liew's lines - the aforementioned subway scene amply demonstrates the two artists tickling one another creatively. Meanwhile, Nick J Napolitano chooses, and uses, his fonts wisely. Editors Amedeo Turturro, Andy Khouri and Brian Cunningham give the book a bit of extra personality with a rather cute footnote, and I like that DC credits Gardner Fox and Hal [sic - see Comments, below] Sherman for their Golden Age creation. Top off with either Liew's delightfully imaginative, or Ibrahim Moustafa's quietly dramatic, cover, and you have a new series from DC that deserves to find a wide, appreciative audience. The artist co-creator of Dr Fate is Howard Sherman, not Hal, who co-created the Star-Spangled Kid with Jerry Siegel. Oh, nice one Britt - I'll stick a note in the post. The Archives of the Golden Age Dr. 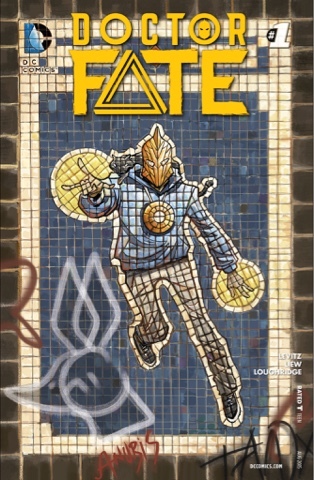 Fate is a fascinating read (and thick -- all of his solo tales except for a couple of solo JSA bits in one fat volume). The first third consists of the Fate we normally think of unless we're Roy Thomas -- full helmet, mysterious, with magical enemies and a somewhat Lovecraftian tone. The next third, he becomes a Superman-like figure with a half-mask and no real magical powers other than super-strength and flying. In the final third, he goes to medical school to become an MD (I'm not kidding) and generally battles the sort of ordinary villains that even Batman would find boring. And then his solo tales are gone, by late 1944, though he'd persist in the JSA for awhile after. His entire solo Golden Age career is less than five years long, and only the first 18 months or so give us the stories that later writers and editors actually want to riff on (Roy Thomas got stuck with half-helmet Dr. Fate in All-Star Squadron because of his attention to continuity and boy, is half-helmet Fate as exciting as a wet noodle).